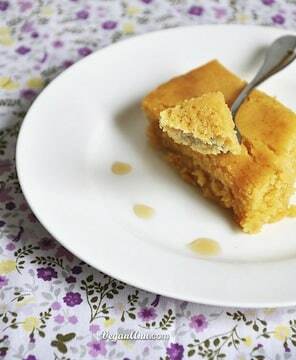 Compared with traditional bread, this corn bread is closer to cake. However, it’s not the type of cake you bake for special occasions, but a quick bread type of cake that you bake for teatime, afternoon snack, or breakfast. Unlike traditional corn bread, which tends to be a bit crumbly, I use syrup and apple juice to give it a fruity fragrance and extra moisture. This results in a perfect teatime cake with a brownie-like texture, which I happily enjoy with a glass of golden apple juice. Contributed by Annie Taylor Chen, Vegan Ann. Heat the oven to 350° F (175° C). Grease a 9×13 inch baking pan. Combine and sift all dry ingredients, stir to mix well. In a large mixing bowl, beat soy milk, canola oil, rice syrup, agave nectar, apple juice and vanilla extract until they are dissolved. Add the wet mixture gradually into the dry one and use a whisk first to lightly mix the batter, never beat it. Then switch to a silicon spatula and use a folding method to mix well. Pour the batter into the greased baking pan. Bake for 30 minutes or until a toothpick inserted into the center of the bread comes out clean. Allow to cool completely, then cut into squares. Why wait for Tea time? I think I’ll try this for breakfast.